So I haven't updated in a while, I have been eating out and in some interesting places too! I thought I'd do a round-up of them! First off is lunch at Cafe in the Crypt at St Martin in the Fields. 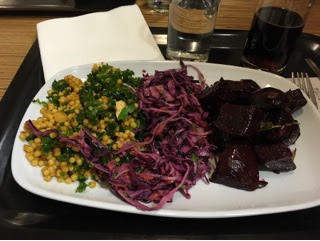 I had three salads, couscous and kale salad, red cabbage salad and beetroot salad. They also do a really good Pasteis de Nata! We then went to BB Bakery for cake. I had one of the best cakes I've had in a long time! 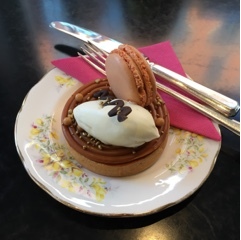 It was a salted caramel chocolate tart and it was so good. 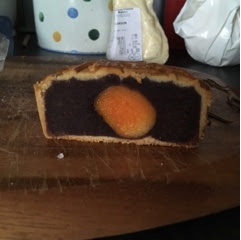 I also bought a moon cake from China Town and finally got one with a salted egg yolk in the middle. It was also yummy but in a completely different way to the one above and can definitely only be eaten in small pieces! I went to Roti Chai for dinner, we went to the street kitchen bit and enjoyed Aloo Papri Chaat, Parsi Chicken Farcha, Manchurian Chicken Curry with Rice and Winter Lamb Porridge with Pao Bread. The best bit was definitely the Aloo Papri Chaat, really tasty. We then went to Selfridges and to the Lola's Cupcakes concession. Where we shared a piece of the salted caramel cake. It was seriously good! I also had dinner at Chick 'n' Sours in Covent Garden. We had the Mexi-nese nachos, which were yummy and the biggest fried chicken burger I think I have ever had! I also went to The Mac Factory by Euston Station. I walked straight past it the first time I went as it is literally just around the corner onto North Gower Street! I had the Mambo Italiano; pancetta, mushrooms and garlic. The mushrooms were great and the mac and cheese was superb and creamy, the pancetta was way over cooked and didn't add much. The second time I went I had La Med Babe; pesto, sundried tomatoes and mozzarella balls. 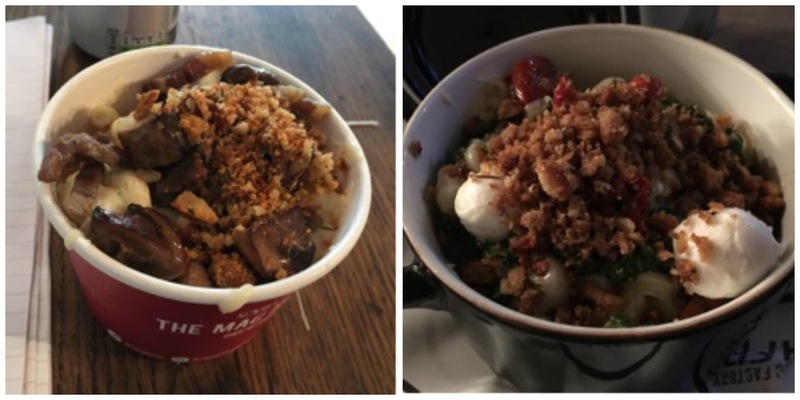 Again the mac and cheese was super and the pesto and sundried tomatoes were awesome but I'm not sure what the point of the mozzarella was. It is definitely a good spot to pop into if you are in the area or catching a train from Euston, better than any of the offerings closer to the station, although I do want to try Roti King! 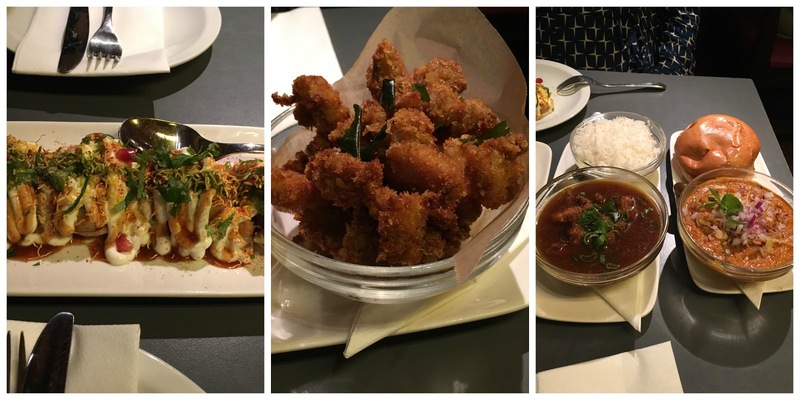 I went back to Guglee on Finchley Road. I have been here several times as it's close to Hampstead Theatre and have never been very impressed. 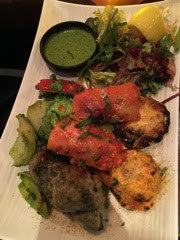 This time I picked the Vegetable Mix Grilled Platter and it was delicious and definitely one to order again. Lots of veg and very tasty. For my sister's birthday we went to Tombo Poke. 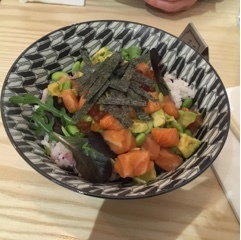 Poke seems to be the new thing to eat in London but I wasn't all that impressed. The rice to other food ratio was off, there was way too much rice. We picked the Avo Salmon Lux and it was ok, nothing special and certainly nothing I could not have done at home. 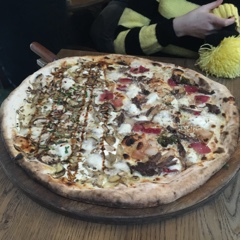 I took another trip to Home Slice, this time in Old Street. I shared the pizza again and I had the Wild Venison with Kale, Caramelised Onions and Dukkah half. It was so good. The caramelised onions were out of this world and the toppings as a whole were just fabulous. We then popped into Crumbs and Doilies for cake. 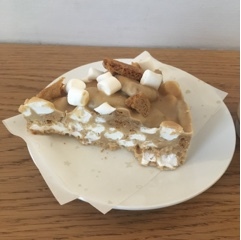 I went for a Biscoff Rocky Road, which was very tasty. Now we're getting more up to date! 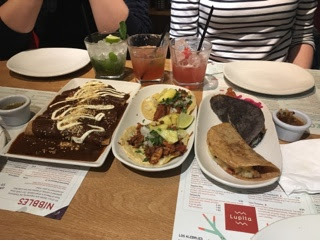 Last week I went out for a friends birthday to Lupita on Villiers Street, by Charing Cross station. 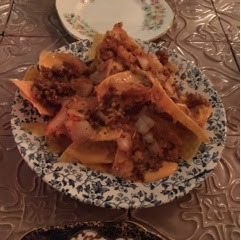 I am told that this is very authentic Mexican food rather than Tex Mex. We had the Guacamole Artesanal with Totopos, Enchiladas Mole, Tacos Al Pastor and Chorizo con Papas Quesadillas. All were delicious. We also has the Churros con Caleta for dessert and they were way better than the Churros I had in Madrid. We also had cocktails, I went for a Mojito and it was perfect.